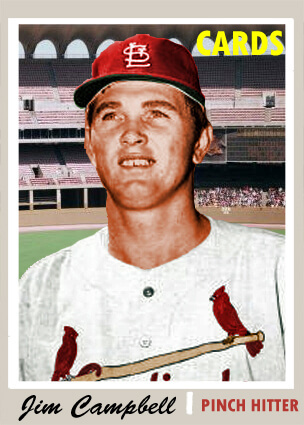 Facsimile 1970 Jim Campbell created by St. Louis fans. Campbell played briefly for the Cards during his only big league season. 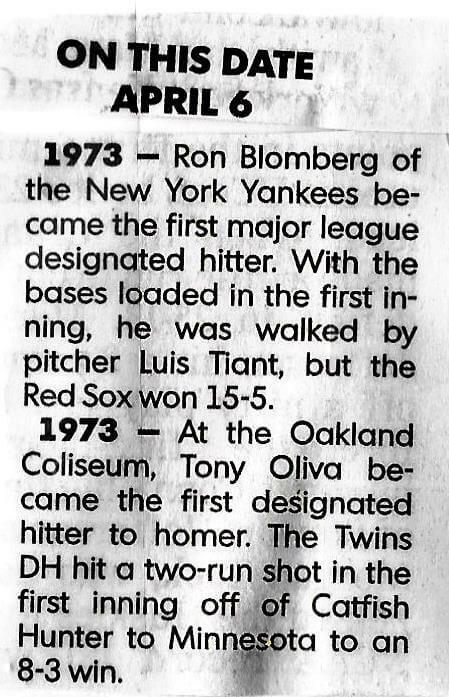 On April 25th, 1969, at the Silver Stadium home opener, Rochestarians saw history. 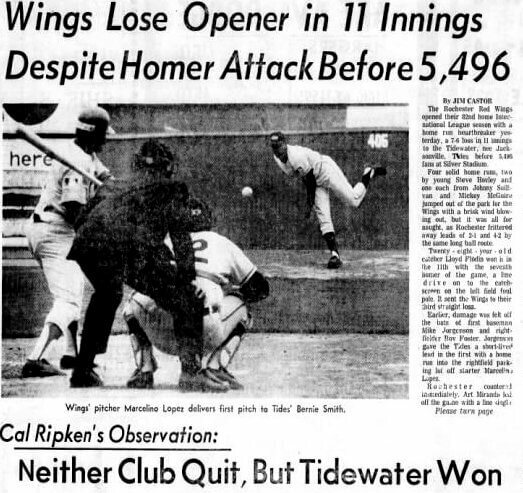 That day, Wing’s manager Cal Ripken gave the umpire a lineup card in which the 9th place hitter was not the starting pitcher, Marcelino Lopez, but instead was Jim Campbell, penciled in as Designated Pinch Hitter. Most baseball fans know the American League adopted the designated hitter in 1973, primarily as a way to increase offense and lengthen the careers of older star players, like Henry Aaron, who could bat without having to play the field. 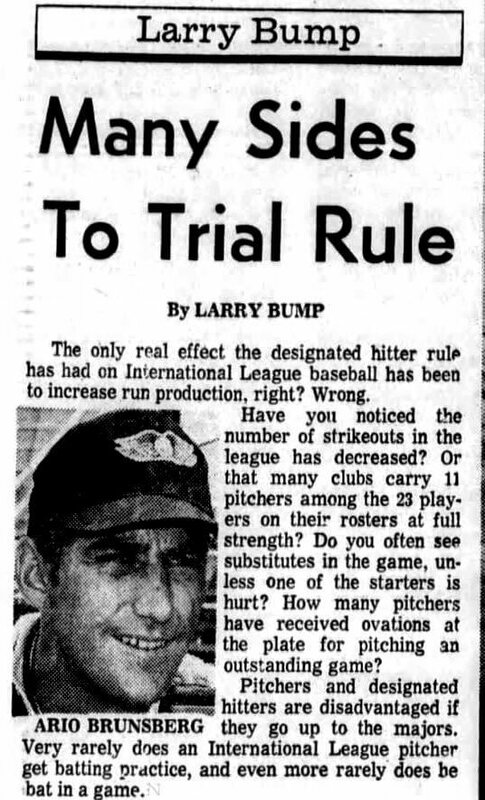 Less well known is that in 1969 the International League used the designated hitter in a one year experiment. The season before saw offensive numbers plummet during the so-called Year of the Pitcher. The IL’s President George Sisler Jr. agreed to adopt the DH so the major leagues could evaluate its effect. At first, there was confusion as to what the new position should be called. When the experiment was discussed the previous winter, it was called the “Wild Card.” In his column on the home opener, George Beahon referred to the position as the Designated Pinch Hitter. The box score lists Campbell as the DPH, as did Ripken when he filled out the lineup card. The next day, IL President Sisler explained the proper name was the Designated Hitter (DH), and the appellation stuck. After reviewing columns and accounts of the 1969 season, I was surprised the tradition breaking rule was not the subject of more controversy and debate, and more condemnations from purists. After all, pitchers had been batting for themselves for a hundred years. More probably, minor league fans realized that AAA is a primarily a training ground and incubator for players to reach the majors. The parent club puts a low emphasis on the farm teams won/loss record, instead dictating how players are used. So being the subject of an experiment did not seem to bother the fans who were accustomed to being guinea pigs. The most important factual document pertaining to the DPH [sic] is kept in a desk drawer in the office of Carl Steinfeldt, the 32-year-old general manager of the Rochester Red Wings of the International League, which experimented with a DPH rule during the 1969 season. On the last three days of the season 5,000 questionnaires were given out to spectators at Rochester. The fans were asked to return them at their own expense, and 3,322 were completed. The verdict was 59% in favor of the DPH, 31% against and 10% on the fence. By Presidential election standards, that is landslide popularity. Apparently, Red Wing fans — at least those who answered the survey — were not diehard purists. As mentioned in two articles, the biggest drawback was the rule put some players at a competitive disadvantage. 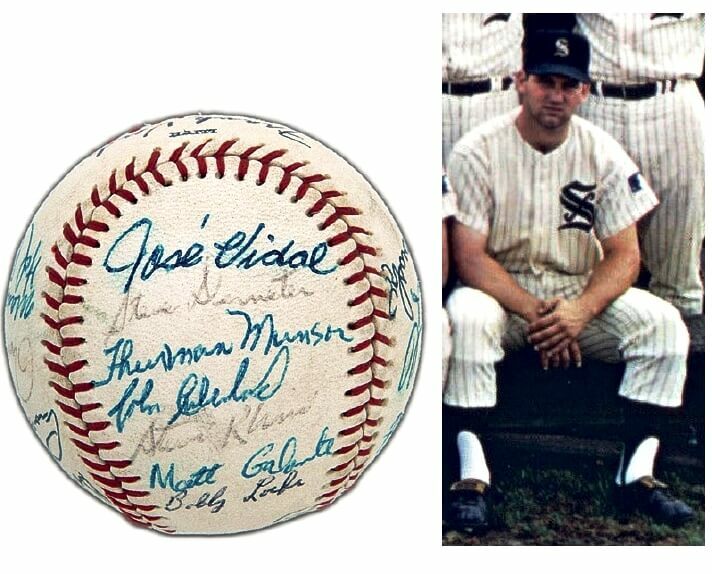 Ball signed by Thurman Munson when a member of the 1969 Syracuse Chiefs. When an International League pitcher advanced to the majors, he may not have batted all year. Also, position players worried that if they were the DH too many times, they would be viewed as one dimensional with less value in the majors where the position did not exist. For example, Jim Campbell , who had the most DH at-bats for Rochester, would only play briefly in the majors, logging 13 at bats as a pinch hitter for St. Louis in 1970. 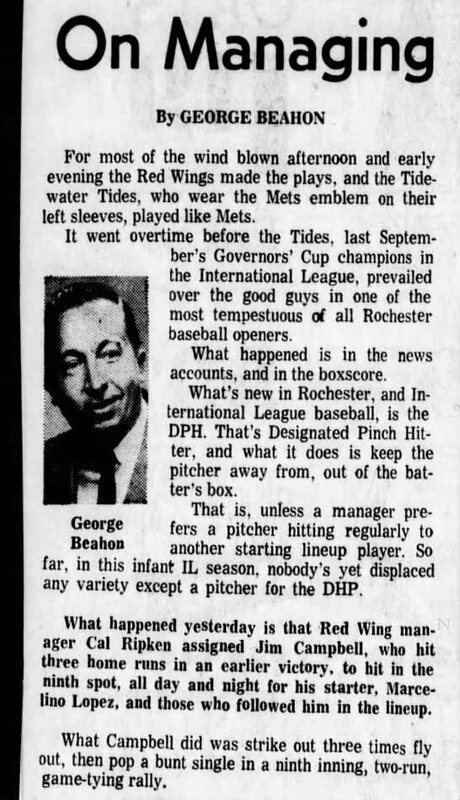 Perhaps fittingly the Wings first “Designated Pinch Hitter” never played the field when he had his cup of coffee in the big league. 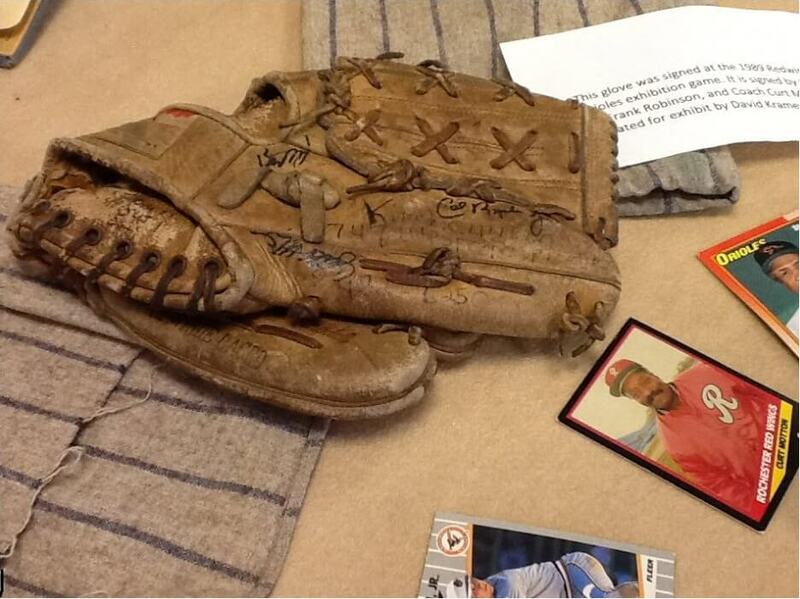 One of that seasons’ most prominent players, Thurman Munson of the Syracuse Chiefs, did benefit from the rule. Munson was the starting catcher, but when not catching he was the designated hitter, allowing him to have a full slate of at bats and lessening the wear and tear of catching. Ultimately, the experiment was discontinued after one season. Sisler was a strong advocate, noting the increase in offense that fans seemed to want. Batting averages climbed from .251 to .269. In “Distinguished History” (1993), Sport’s Illustrated‘s Steve Wulf thinks the IL “bowed to the pressure of baseball purists” when discontinuing the DH. No doubt Wulf is right that purists objected. But, more likely, the discontinuation of DH was a more prosaic decision. With no DH in the major leagues, it did not make sense to employ the DH in the minors. Ultimately, pitchers would be unprepared as hitters and designated hitters could less easily develop their fielding skills to the disadvantage of the parent club. Nonetheless, 1969 certainly paved the way for 1973.